Krishtof Korda, 412th Test Engineering Group, powers his way through the Alpha Warrior Battle Rig during the timed competition. Korda was the first Team Edwards member to complete the course. 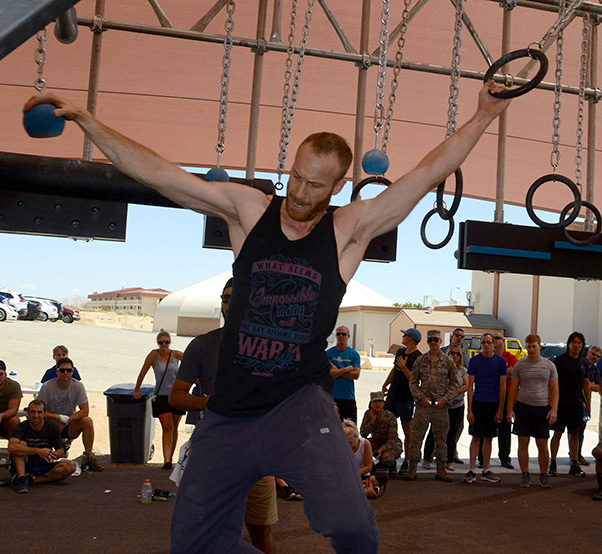 Dozens of Team Edwards members gathered at the Rosburg Fitness Center at Edwards Air Force Base, Calif., Aug. 23, 2017, for a chance to test their physical prowess and compete against each other, and the clock, on an Alpha Warrior Battle Rig. The Alpha Warrior tour, an Air Force Services sponsored event, brought the Battle Rig to Edwards as an introduction to the Air Force Alpha competition. 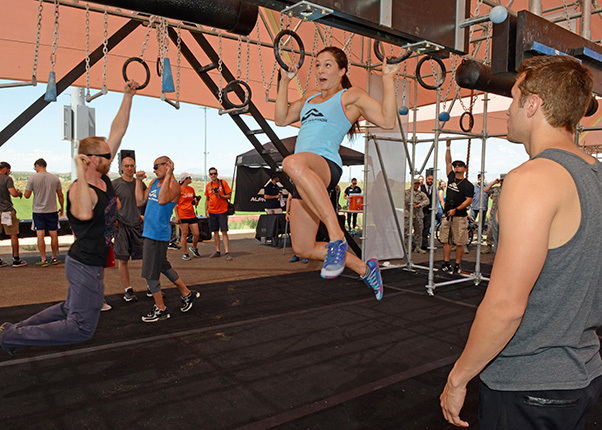 The equipment, inspired by the “American Ninja Warrior” show, was introduced and demonstrated by two athletes – Alpha Warrior pros Brent Steffensen and Rebekah Bonilla – who are competitors on the show. Steffensen thanked those who attended for their hard work and sacrifice to defend the country. He said the Air Force is special for him as his father was an Air Force B-52 pilot. 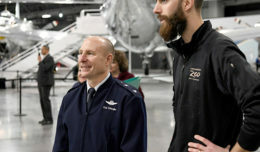 Bonilla also thanked Team Edwards for what they do and said she was impressed by the Airmen and the aircraft and mission of Edwards Air Force Base. 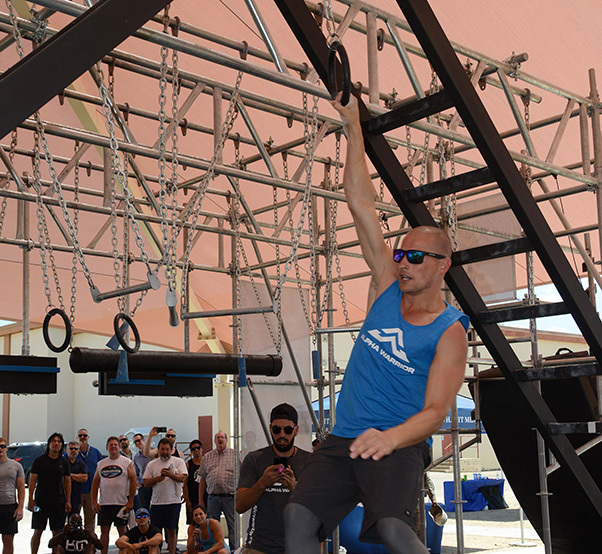 Brent Steffensen, an Alpha Warrior pro, makes the last obstacle on the battle rig look easy as he demonstrates before the timed competition Aug. 23. The pros started the day with a physical training session at 7 a.m., then showed Airmen, civilians and family members how to navigate the Battle Rig. The participants were given a couple of hours to work on their techniques and finally the Alpha Warrior Team held timed competitions in the afternoon. Another miniature Battle Rig was set up for children to compete. According to the team members, an Air Force-wide competition is scheduled later this year in San Antonio, Texas. 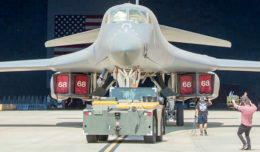 Air Force bases worldwide were divided into regions and each regional Air Force Base will receive the Battle Rig on a long-term basis for competitions. Each participating installation receives a Battle Station, which is a scaled-down version of the competition equipment for Airmen to train with. Winners of regional competitions will be invited. The Battle Rig for Edwards’ region will be at Nellis Air Force Base, Nev.
For more information about Alpha Warrior visit www.alphawarrior.com, or the 412th Force Support Squadron’s website at https://edwardsfss.com/wordpress/. Alpha Warrior pro Rebekah Bonilla tackles the Battle Rig that was set up at the Rosburg Fitness Center Aug. 23. 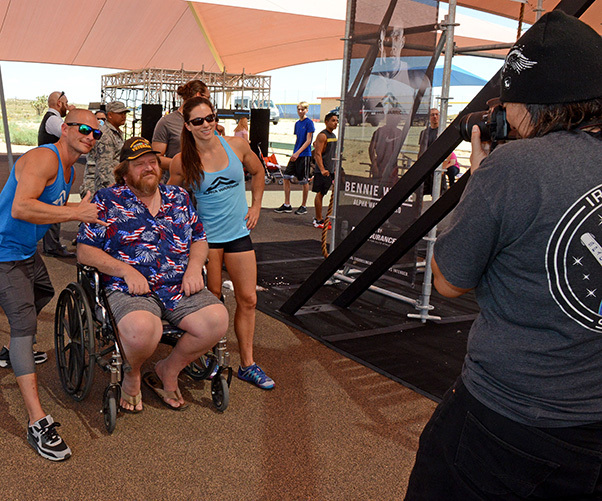 Alpha Warrior pros Brent Steffensen and Rebekah Bonilla pose for a photo Aug. 23.